The Little Wonder Xtra™ Edger combines the maneuverability of a stick edger with the power of a wheeled edger for the best of both worlds. It's great for curbs, sidewalks, driveways, tree rings, flower beds, or any area that requires neat, clean edging. 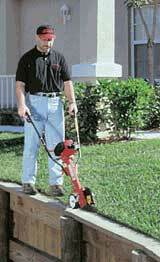 Plus, the Xtra Edger is ideal for edging in confined or narrow areas where traditional wheeled edgers can't go. Because all of the weight is supported by the wheel - and not the operator - the Xtra Edger is EASIER and much less tiring to operate! For extra versatile, lightweight, affordable performance, choose the Little Wonder Xtra Edger.